Ghada Bassioni was born in Cairo, Egypt and spent the first seven years of her life in Dortmund, Germany, while her parents (both professors) did their PhDs. She is a graduate of the German School in Cairo and obtained her BSc from the Faculty of Science, Ain Shams University in Cairo. After her MSc in 2000, jointly from the Technical University Munich, Germany and the Ain Shams University, she received her doctoral degree (Dr. rer. nat.) in 2004 from the Technical University Munich. She is currently an Professor and the Head of the Chemistry Division at the Faculty of Engineering, Ain Shams University and is a member of the Egyptian National Committee for Pure and Applied Chemistry, Egyptian Academy of Scientific Research and Technology. She is appointed as the Egypt-Germany coordinator, Science and Technology Development Fund (STDF), Egyptian Ministry of Higher Education and Scientific Research and has been a member of the Global Young Academy since 2013. Ghada has dealt with a wide variety of topics in chemistry and chemistry-related subjects during her career. After her BSc in chemistry, she started as an inorganic chemist in her Masters, went into organometallic chemistry for her PhD and dealt with physical chemistry and interfacial science phenomena in her postdoctoral studies in the field of construction materials and petroleum chemistry. She has over 50 scientific publications in peer-reviewed journals and conference proceedings and is a reviewer to a number of renowned scientific journals. She has been recognized with several national, regional and international awards and was selected as an academic visitor and panelist at the Nobel Laureates meetings in Lindau, Germany, in 2012 and 2014, respectively. In 2013, Ghada received the Young Scientist Award at the World Economic Forum in Dalian, China. 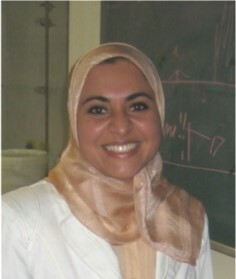 She has organized a significant number of scientific and gender-related conferences and workshops as women’s representative from 2005-2007 at the Technical University Munich, as Chair of the Women’s Initiative at the American Institute of Chemical Engineers, Abu Dhabi Section 2009-2011, and as a member and lead of the Women in Science working group of the Global Young Academy. She has received the LEWA Leadership Excellence for Women award runner-up in 2013 and was an invited speaker within Springboard Women’s Development Project, organized by the British Council in 2013. In 2016, she has been awarded the Fulbright fellowship as well as the L.A.B. fellowship of three organizations: Nobel Laureate Meetings in Lindau, the European Forum in Alpbach and the Falling Walls in Berlin.